Keep your loved ones close to your heart. Beautifully detailed filigree heart locket opens to reveal 2 halves perfect for holding small photos. 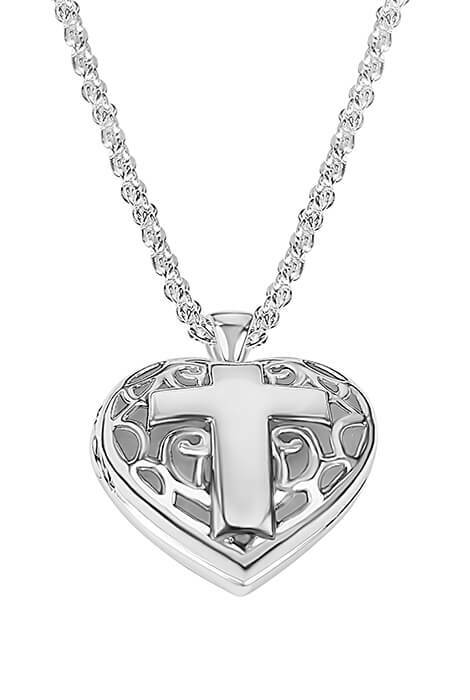 The silverplated cross on the front can be personalized, making it a truly inspiring keepsake. 3/4" wide x 3/4" high heart pendant is on a 17 1/2" long rope chain with lobster clasp. Specify name: 1 line, up to 9 letters/spaces, upper/lower case. Silverplated brass. Allow 4–6 weeks for delivery.